PERFECT FOR PROFESSIONALS OR AT HOME USE, IDEAL FOR ALL HAIR TYPES. Trim your pet's face, belly, hip, legs etc. Pet comb is very practical for grooming pet's hair. Enjoy these well-balanced pre-sharpened fine tools and bring out the beauty of your dog or cat! 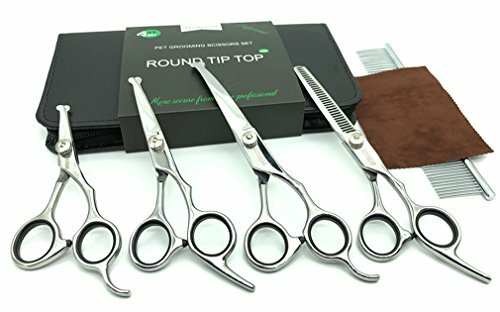 ★ 4+1 GROOMING KITS: Comes with 5.5-inch straight scissor, 4.5-inch straight scissor, thinning shear, curved scissors, a grooming comb. So it can trim any part of your pet such as body, face, nose, ear, tail, paw etc. ★ SAFE FOR YOUR PETS: Rounded tips top for safety. No need to worry about poking your pet's skin with these round-tipped scissors. Safer to use around the face and ears. ★ HIGH QUALITY: Finest quality surgical stainless steel blades for exceptional durability and precision performance. ★ COMFORTABLE AND SAFE: All grooming shears are designed ergonomically for maximum comfort which will reduce hand fatigue for long time use. Silicone pad at the handle prevent accidental clamping of the fingers and avoid harming your hands when used. If you have any questions about this product by Bemibear, contact us by completing and submitting the form below. If you are looking for a specif part number, please include it with your message.